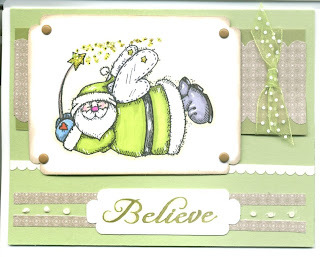 I use this stamp image a lot for Christmas ... isn't he just the cutest ever!!! I colored him with my new Copics and highlighted him with a white gel pen and glitter glue on his magic wand. I outlined him in Copics Wheat to create the shadow. The sentiment was stamped with SU's Always Artichoke and I repeated the shadow on the letters also with the Wheat Copics. I love all the green tones (my favorite color) on the card. Who said that Christmas cards need to be green AND RED anyway!!! Thanks for stopping by and come again real soon ... the week-end and card making time is coming up! !